Marines from Vladivostok have finished training for the international part of «Amphibious Landing-2018». Best Russian members of the military were exercising on «The Ermine» («Gornostai») and «The Clerk» («Klerk») ranges. Now they are going to defend the honor of the country in China. This year the best marines within «ArMI-2018» army games have become Vladivostok team of Pacific Marines called «black berets» («Chernye berety») . This time they will fight for being the best at the international level. 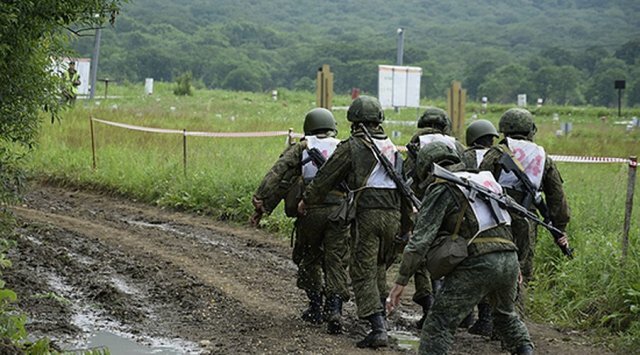 Before going to PRC the Russians were training hard on the seaside military ranges where they developed skills of endurance, knack and working cohesively. The commanding officers’ main goal was to prepare soldiers for obstacles and to teach them to be more self-oriented among different barriers. As it was informed in Pacific Fleet, Vladivostok marines achieved high results during the training for international competitions despite the various weather conditions: rain and heat. It should be noted that 50 people took part in training, but who showed the highest results only are in the national team. Soon they will go to China where the international stage of «ArMI-2018» will take place from 29th July to 12th August.